The Miami Marlins have undoubtedly been the biggest headline makers of the baseball offseason thus far. Of course, they are doing so for all the wrong reasons. Miami is slashing payroll and it seems like every player must go. Thus far, Giancarlo Stanton, Dee Gordon, and Marcell Ozuna have all been traded, with several more players still on the trading block. But the Marlins may not be the only team that could sell off assets this winter. Rumors indicate the Pittsburgh Pirates could be open to a possible fire sale before the offseason is over. Pittsburgh ace Gerrit Cole has already had his name in the rumor mill this offseason. Cole has been mostly linked with the Yankees, who have thus far balked at meeting Pittsburgh’s high asking price. The Pirates don’t appear to be actively shopping Cole. However, they are certainly willing to listen to teams who ask about him, whether it be the Yankees or any other club. “I guess a natural transition is, if we were able to have an opportunity to utilize one of our starters — be it one of our young starters, one of our veteran starters — in a trade that we thought made the organization better, I would think that would make sense for us,” Pirates GM Neal Huntington said earlier this month. Another name that could pop up in trade talks as the winter progresses is outfielder Andrew McCutchen. Of course, McCutchen was mentioned a lot last winter, although the Pirates ended up holding onto him. His name resurfaced over the summer, but again, McCutchen stayed in Pittsburgh. Recent reports indicate that the Pirates are telling other teams that he’s a viable trade chip this offseason. McCutchen’s value was down last winter after a rough 2016. But he bounced back well in 2017, hitting .279 with an OPS of .849. Those numbers could make him a valued commodity once again. However, McCutchen has just one year left on his contract, which could lower the return the Pirates can get for him. It’s also unlikely that any team will make a serious effort to trade for McCutchen until after top outfield free agents like J.D. Martinez are off the board. Meanwhile, one player the Pirates appear increasingly likely to trade is second baseman Josh Harrison. Several teams, including the Blue Jays, Mets, and Yankees, have been linked to Harrison in trade talks. Harrison was an all-star in 2017 and has options that put him under team control through the 2020 season. That makes him an intriguing option for teams looking for a second baseman. Of course, unlike the Marlins, the Pirates aren’t going to go out looking to make trades. They have a young core in place and a solid farm system. However, the Pirates would need everything to break right for them to compete for a playoff spot in 2018. If they have a chance to bolster their young core or farm system further by making trades, the Pirates won’t hesitate to do so. 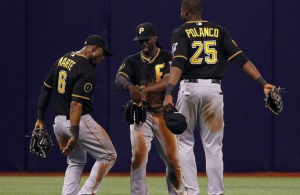 If they receive an offer they can’t refuse for a player like Cole or McCutchen, it could be the start of a fire sale not unlike the one going on in Miami.